CHEESY BACON FLAVOURS BURSTING IN YOUR MOUTH! Get ready to experience these Mozzarella Bacon Bomb Lettuce Wrap Dippers! These little beauties packed with flavour are the perfect party food or starters for a dinner party and they won’t cost you a fortune like other appetizers will. When my wife had this idea to fry frozen mozzarella I thought she was on to something good especially when she said we were going to wrap the sticks in bacon. Ketogenic recipes for low-carb diets are what we are testing out these days although we tend to change them to suit my wife’s tastes. She is a huge fan of spices but since eating bacon is a big deal on the Atkins low-carb diet she no longer uses salt at all. Recipes with bacon always turn out good no matter what and that’s the truth. Bacon can do no wrong and pretty much will match up with just about anything. I’ll admit these Mozzarella Bacon Bomb Lettuce Wraps really were hard for me to stop eating even though they weren’t for me. In total one of these Mozzarella Bacon Bomb Lettuce Wraps come in at around 1.50g net carbs each according to the Atkins Carb Counter. Bacon and cheese are a must if you’ve never tried them fried together. Some people call these bacon cheese keto sticks but after we created this recipe we knew that they needed a more explosive yummy name. In 3 months my wife is now down about 30lbs which is great because she wanted to get rid of the excess weight from after having our son. She is now down to her pre-baby weight but still wants to lose a bit more because she was always working out towards her fitness goals by running 5K a day. These Mozzarella Bacon Bomb Lettuce Dippers are perfect for Low Carb High Fat (LCHF) diets or for those of you who can’t think of a finger food that you want to serve at your next party or dinner. 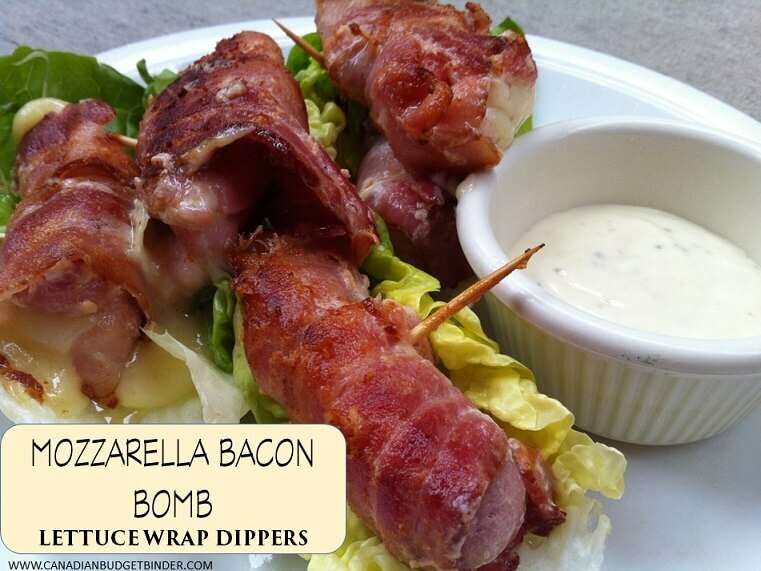 These Mozzarella Bacon Bomb Lettuce Dippers really are the bomb. The mozzarella once fried becomes so cheesy in the middle and pairs perfect with a thick cut bacon which is rolled around the cheese stick then secured with a toothpick. It’s imperative that you put the Mozzarella Bacon Bombs in the freezer for about one hour. What you will achieve is a sold dipper but it will help with the frying process. If you were to fry these Mozzarella Bacon Bombs without freezing them first your bacon will not cook and your mozzarella will just ooze out everywhere. Total fail! Once frozen solid heat up a tablespoon of butter, coconut oil or extra virgin olive oil and place your frozen Mozzarella Bacon Bombs in the pan. Cook evenly on all sides until the bacon is crispy and the mozzarella is nice and cheesy looking. Remove from the frying pan and sit each Mozzarella Bacon Bomb in a bed of lettuce and serve with a dollop of Ranch dressing. You can either buy your ranch dressing or make homemade ranch dressing like we did. To enjoy these delightful finger foods simply remove the toothpick and roll in a med-large lettuce leaf, then dip. You will love them, your guests will rave about them and you won’t believe how fast they will disappear. If you are having a big crowd plan on tripling the recipe. Dinner or snacks with bacon makes everything better… in moderation of course. These Mozzarella Bacon Bomb Lettuce Wrap Dippers are the perfect party food or appetizers for a dinner party. 1 tbs of coconut oil, butter or extra virgin olive oil for frying. On a cutting board slice your mozzarella into thick sticks and wrap with bacon starting with one end then flipping over and doing the other side so it's wrapped like a gift or parcel. You will use approx 2 strips of bacon per bacon bomb. Put the fat in the frying pan on med-high heat and add a few at a time so you don't crowd the pan too much and lose heat. I don’t normally get into making appetizers but since the wife wanted something fast to make in the morning for breakfast these worked out perfect with a side of scrambled eggs. You can make these Mozzarella Bacon Bombs ahead of time and freeze them so you can take them out as needed. They should keep well in the freezer up to 3 weeks. Anything with bacon. That’s surely delicious! Yummy. Seriously, bacon is the best food invention ever! My opinion is that bacon always makes everything taste better….Yum-yum!! That and the smell is so intoxicating.